Gift of Elton L. Puffer, 2004.61.A-.B. © Asian Art Museum, San Francisco. Reed’s rich history in the art of fine handwriting of the West expands to include the Arabic tradition with the opening in February of the Cooley Gallery exhibition Qalam, Arabic Calligraphy from the Middle Ages to the Present. The exhibition provides an overview of historical Arabic calligraphy, “one of the world’s most poetic and spiritual art forms,” and is curated by Prof. Kambiz GhaneaBassiri [religion 2002–] and Stephanie Snyder ’91. Among works on display are rare pieces on loan from the Asian Art Museum of San Francisco, manuscript folios courtesy of Steven Herold ’63, qur’anic and secular fol-ios from the 9th to 19th centuries, traditional writing implements and materials, a documentary film, and a body of contemporary work by Iranian calligrapher and visiting scholar Hamidreza Ghelichkhani, who has taught calligraphy, paleography, and typography for more than a decade. 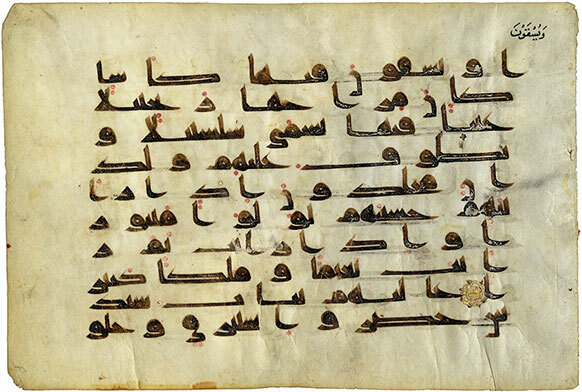 Ghelichkhani gives a public lecture in April and also leads a five-week Arabic Scriptorium in conjunction with the Calligraphy Initiative in Honor of Lloyd J. Reynolds. Qalam runs through April 27 in the Cooley Gallery.